If you're on the hunt for a casual yet totally chic ensemble, go for a charcoal blazer and charcoal dress pants. Both pieces are totally comfy and will look fabulous together. To bring out a sassier side of you, complement your outfit with white canvas low top sneakers. Dress in a Romeo Gigli Vintage iridescent boxy blazer and black leggings, if you want to dress for comfort without looking like a hobo. Rocking a pair of black suede over the knee boots is an easy way to add extra flair to your outfit. 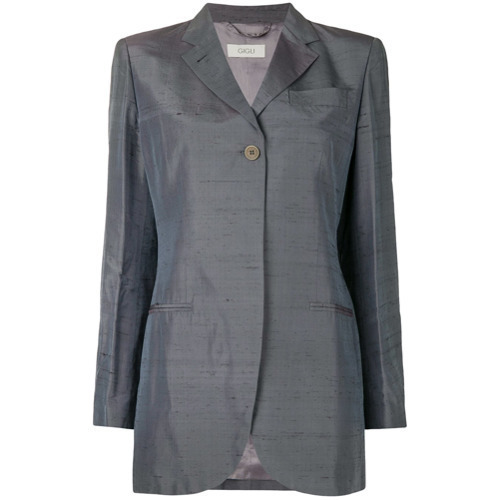 If you're searching for a casual yet totally chic look, choose a Romeo Gigli Vintage iridescent boxy blazer and a grey full skirt. Both pieces are totally comfy and will look fabulous paired together. You could perhaps get a little creative when it comes to footwear and elevate your getup with grey leather pumps. If you're scouting for a casual yet stylish getup, dress in a Romeo Gigli Vintage iridescent boxy blazer and a black sequin mini skirt. Both garments are totally comfy and will look fabulous together. For something more on the daring side to finish off this look, choose a pair of pink fur flat sandals. 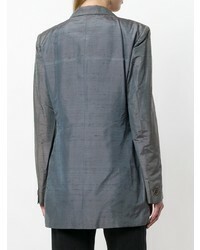 If you use a more relaxed approach to style, why not choose a Romeo Gigli Vintage iridescent boxy blazer from farfetch.com and black skinny pants? Tan suede slip-on sneakers will deliver more playfulness to your look. Opt for a charcoal blazer and blue jeans to show you've got serious styling prowess. Got bored with this look? Enter grey cutout leather ankle boots to spice things up. We all seek comfort when it comes to dressing up, and this combination of a charcoal blazer and light blue ripped boyfriend jeans is a practical illustration of that. Amp up the cool of your outfit by wearing tan leopard suede loafers. If you're looking for a casual yet absolutely chic outfit, go for a charcoal blazer and white dress pants. Both items are totally comfy and will look fabulous together. To bring out a sassier side of you, finish off your look with white leather flat sandals. If you're obsessed with relaxed dressing when it comes to fashion, you'll love this extra adorable combination of a Romeo Gigli Vintage iridescent boxy blazer and charcoal leggings. Throw in a pair of brown suede knee high boots to take things up a notch.